Social Security was born on August 14, 193578 years ago today. Back then, more than half of America's elderly lived below the federal poverty line. But today, thanks to Social Security, that number is less than 10%. 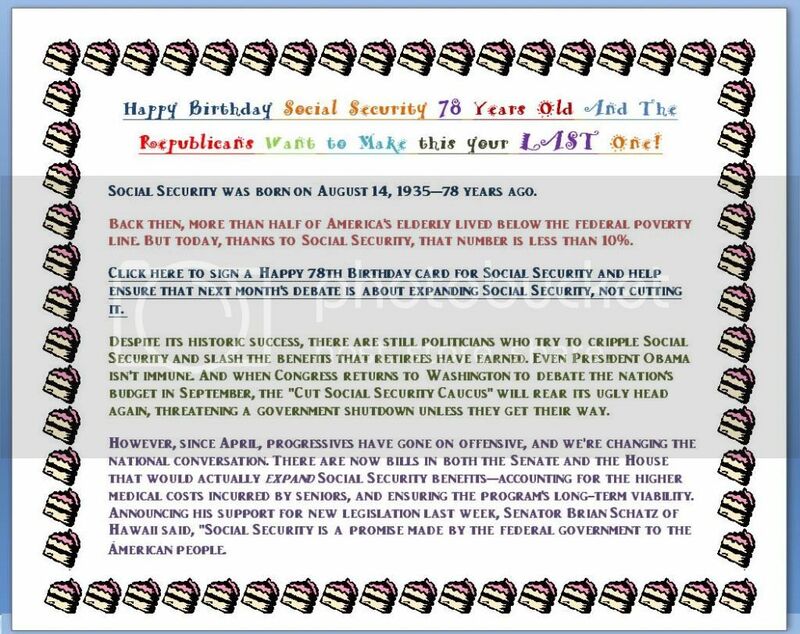 Click here to sign a Happy 78th Birthday card for Social Security and help ensure that next month's debate is about expanding Social Security, not cutting it. Despite its historic success, there are still politicians who try to cripple Social Security and slash the benefits that retirees have earned. Even President Obama isn't immune. And when Congress returns to Washington to debate the nation's budget in September, the "Cut Social Security Caucus" will rear its ugly head again, threatening a government shutdown unless they get their way. However, since April, progressives have gone on offensive, and we're changing the national conversation. There are now bills in both the Senate and the House that would actually expand Social Security benefitsaccounting for the higher medical costs incurred by seniors, and ensuring the program's long-term viability. Announcing his support for new legislation last week, Senator Brian Schatz of Hawaii said, "Social Security is a promise made by the federal government to the American people." Well, MoveOn members agree, and we'll fight like hell to make sure that promise is kept.